One of the most popular new resources available to you is NAEYC Radio. The program enables you to listen to brief, insightful interviews with leading experts in early childhood development right on your computer 24/7/365. Available “on demand,” NAEYC Radio provides a fast, easy and convenient way to stay on top of the latest developments and “next” practices in the field. NAEYC Radio is part of the BAM Radio Network, an Internet radio channel exclusively dedicated to programming on developing a child’s body and mind through appropriate practices. This program will be automatically updated monthly. 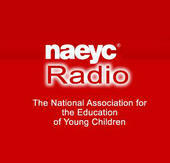 You can also go to http://www.bamradionetwork.com/naeyc-radio/ to hear previous NAEYC Radio programs.